Magnificent estate home with a million dollar view overlooking the 8th tee of beautiful North Ridge Golf Course. Backyard is an ideal place for relaxation and has hosted many a family gathering and even a few lovely weddings. Main level has spacious foyer which leads to the formal Living and Dining Room with handsome fireplace flanked by built in bookshelves, coffered ceiling and views for days! Dazzling Kitchen with gorgeous granite counter tops, stainless appliances, built in refrigerator, superb cabinetry and open to the spacious Family Room and Breakfast area. 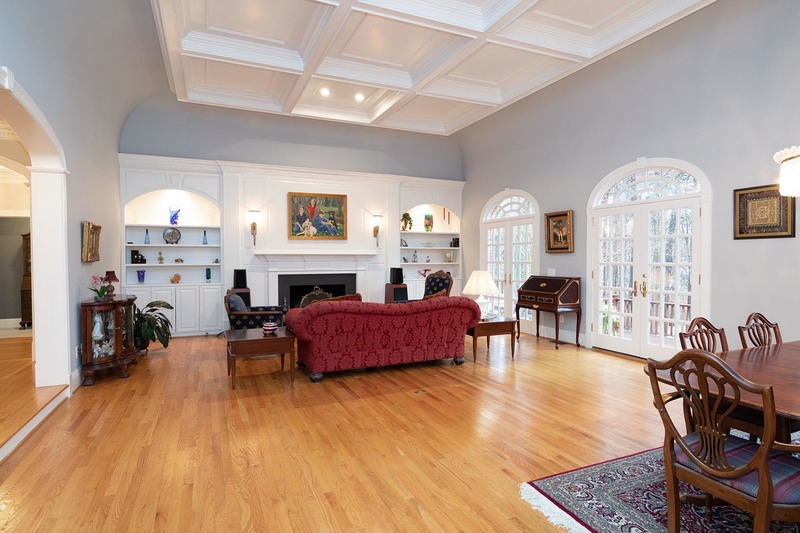 Lustrous hardwood floors throughout most of the main level living space. Marvelous Master Suite with luxurious stylish bath, cozy fireplace and stunning views of the golf course. Second level features Loft/Office overlooking Family/Sun Room, three Bedrooms, Bonus Room with built in bookcases is the perfect teen hangout, theater room or hobby space. Don’t miss the bodacious finished basement with room for the weekly poker game, family game or movie night. Basement also features a Bedroom with adjacent modern Bathroom and cedar closet. Over 6000 square feet with spacious living areas, spectacular views and exquisite touches. This home has been adored and it shows.